In the last decade or so, Hollywood has launched a number of gimmicks to increase movie ticket sales. For example, these days, some people don't go out to see a movie unless it is on an IMAX screen, and in 3-D. Yet this trend is not new. In the mid-1970s, for example, Universal Studios launched "Sensurround," a sound system add-on which could generate a kind of low frequency "rumble" at appropriate times during a movie. 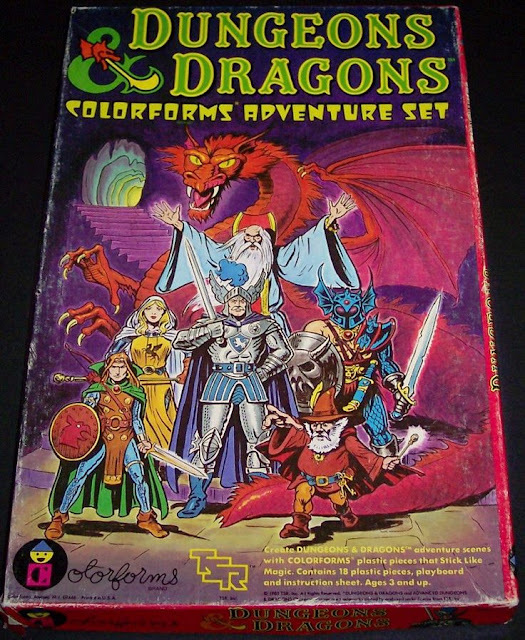 The process was described as a "startling new multi-dimension" of film-going. 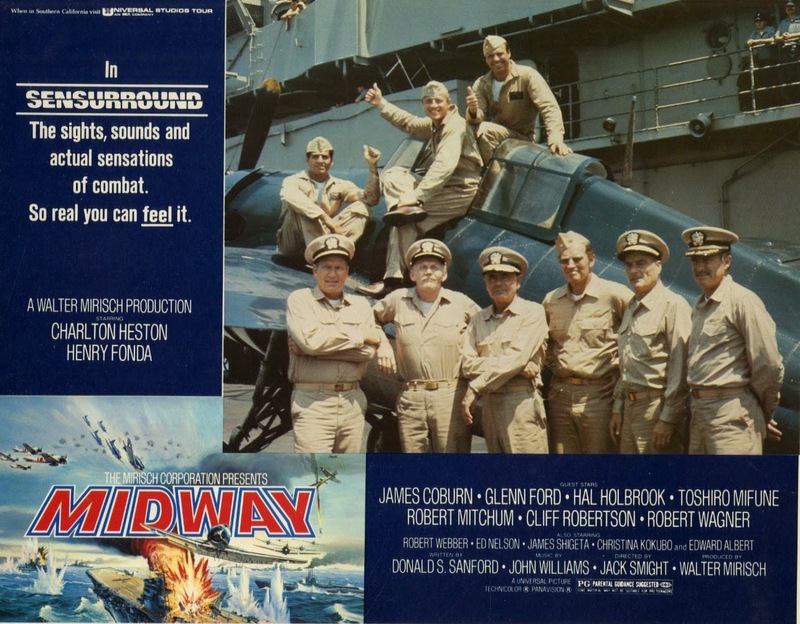 Virtually all the movies that featured Sensurround benefited from the sound system, because they featured a lot of action, and a lot of violence. It wasn't so much that you heard noise at appropriate times, it's that you felt the noise reverberating in your body. The downside to "Sensurround" came if you happened to be seated in a theater close by, sharing a wall with a movie screened in this format. You would get rattled too, whether you wanted to or not, whether it was appropriate to your film or not. Also, there were also some anecdotal reports of theater damage due to the use of Sensurround equipment. In other words, ceiling tiles might shake loose and drop in the auditorium as the Sensurround rumble carried you off -- and immersed you -- in another world. 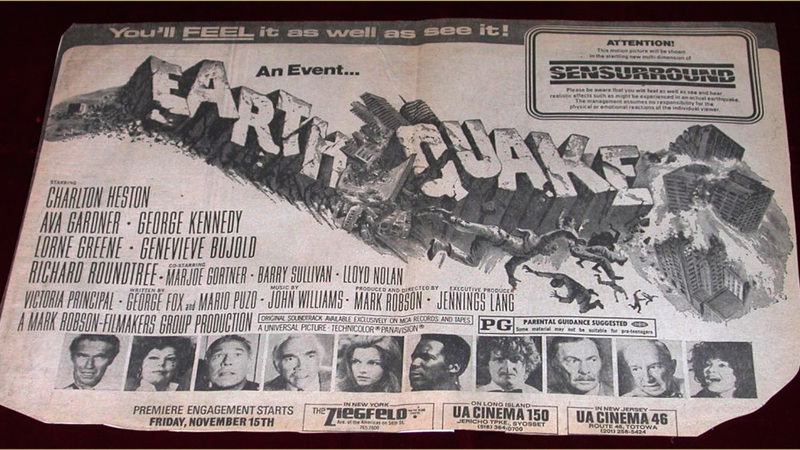 The first Sensurround movie was Earthquake (1974), an appropriate selection, given Sensurround's nature. The ads for the film warned viewers: "You will feel as well as see and hear realistic effects such as might be experienced in an actual earthquake." 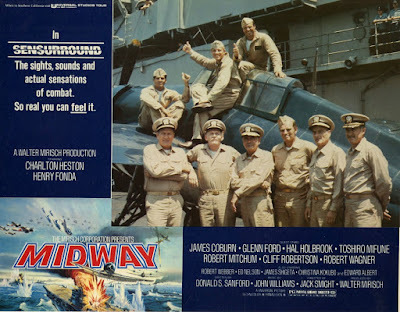 By 1976, and the release of another Sensurround movie, Midway, there were approximately eight-hundred theaters in the U.S. equipped with Cerwin-Vega made technology, which had to be rented by theaters. Worldwide, approximately 2,000 theaters could accommodate Sensurround. 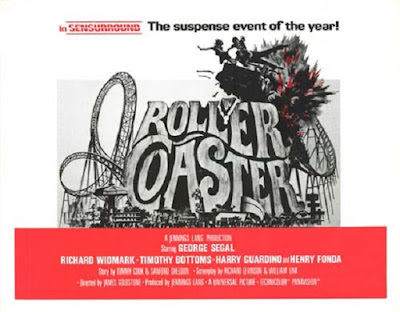 The Universal Sound Department earned a Scientific and Engineering Academy Award, as well, for Sensurround, and the hits kept coming, like 1977's disaster film, Rollercoaster. Although not as widely known or remembered, Sensurround ended up having competition in theaters, such as 20th Century Fox's "Megasound" technology. Growing up in the seventies, I remember many print and TV ads trumpeting Universal's Sensurround technology, but the only film I saw of the type was Battlestar Galactica (1978),a theatrical version of the ABC televised pilot (trimmed down, and with a different fate for John Colicos' Baltar...). 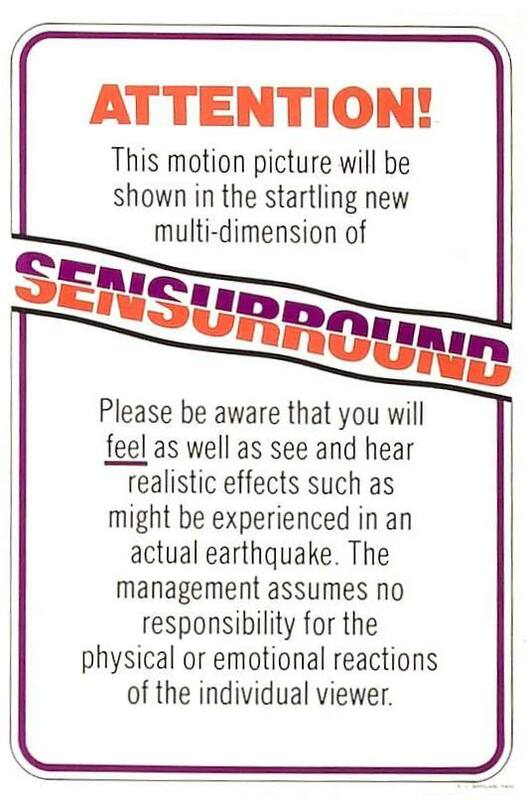 In this case, Sensurround really did add a new dimension -- or "super reality" -- to the movie-going experience. 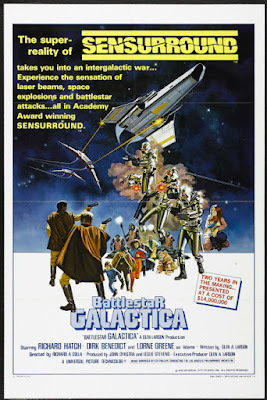 I had seen the story of Battlestar Galactica on TV (probably at least twice), by the time the movie came to theaters in New Jersey, where I lived. But the process of Sensurround turned the movie into something a bit different. Now, when the Colonial Vipers launched from the Galactica, you could feel the power of their thrusters in your gut. By the early 1980s, Sensurround was passe, and the movie industry was moving on to new horizons in sound and picture quality (thanks in part to THX). But still, I get a little thrill of nostalgia every time I remember the aptly-named "Sensurround." So wanted to see Earthquake in the process. I saw Earthquake in a theatre with Sensurround. It was kinda fun when the first quake hit, with the seat vibrating and that weird inner ear sensation you get at a concert when the bass is cranked up. But then as it kicked in for every aftershock, it became annoying and distracting. By the time the last aftershock hit, I remember groaning to my dad, "Not this again." I also recall sitting in a multiplex watching something like "The Way We Were" and during a quiet, emotional moment, the room started shaking because they were showing Earthquake next door. Thank God THX came along! And the world first spoke to me in SenSurround.